I was quite sad to hear about the passing away of the great Wally Hayward - one of South Africa's and the world's greatest ultra long distance runners - at the ripe age of 97. Setting long standing world records for the 100 km (16 yrs), 100 mile (15 yrs) and 24 hour track (26 yrs, and to this day has only been bettered by one person). You can read more of his great acheivements on the website of the marathon named in his honour - http://www.wally.org.za (Background). 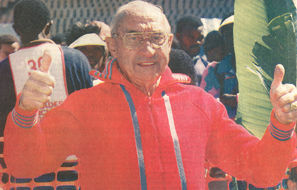 Wally was a true running legend, and accordingly, I think the title of this post is quite appropriate.